Monkey Comments: A cat, a horse and buggy, a floating cop car, explosions and… gosh that’s a nice outfit, don’t you think? Is that some kind of skellington costume she is wearing? And who’s to blame for the smoke? Neither she nor the cat is even acknowledging its existence. It’s Friday! I’m in love! She’s mad because she forgot to leave enough material to allow her shirt to cover BOTH shoulders again. And Rebecca Black’s song and video are still worse than this cover! I want the name of the artist of this ghastly book cover. The arms look like a Holocaust victim. Or at least a starved supermodel. Not quite in the same league as the Michael Whelan classic. @ Bibliomancer = awful covers. I even looked up other covers and they are all horrible. Interesting scene depicted here. So we are to assume Friday is an apathetic beotch who watches an town burn to the ground while playing with Mr Whiskers? I hope Mr Whiskers pees in her space ship, try to get that smell out Friday, it is just as stinky as this cover!! 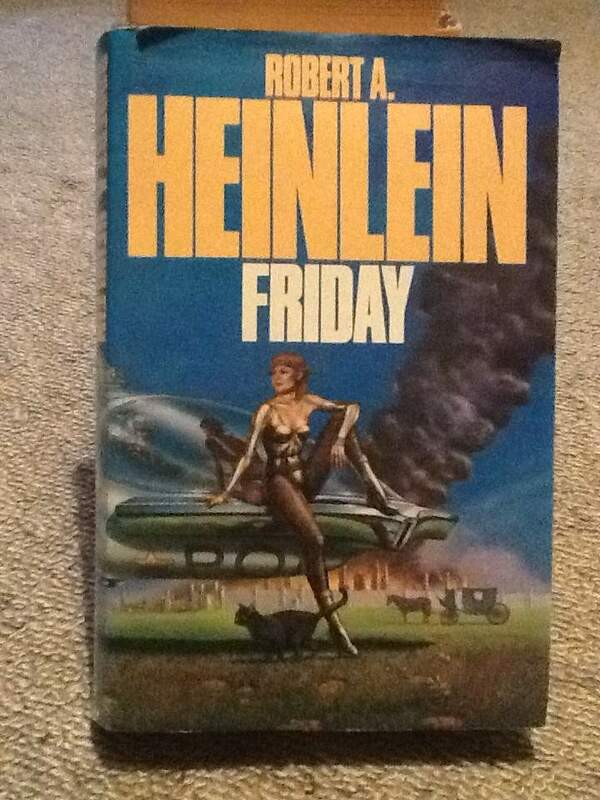 @Rags — Are you saying the Michael Whelan Friday cover is awful? Seriously? @BM, I’m more with Rags on this one. Take a careful look at the eyes (hers, not the porthole). You’ll notice they’re pointed in different directions. Mr. Whelan’s inadvertently given her brain damage! The fact that one of her cheeks looks more sunken than the other, and the shading along her right jaw is off, makes half her head look like it was stitched on while the rest is normal. The gratuitous mammary, while executed properly, pushes this out of the uncanny valley into bad taste. No, no, no. @Dead Stuff — Michael Whelan’s Friday is iconic and most SF/Fantasy art critics consider it one of his best. You may have your opinion but you’ll find yourself in the minority on this one. BTW, sorry but I don’t see any of your observations on the eyes, cheeks or jawline. I see the eyes of a beautiful cyborg. Re: The Whelan coverâ€”at least the shag is better than a mullet. I vote with the ‘Mancer. The zippers alone add a sense of panache entirely missing from the Kate Moss wannabe on this cover. Cover artist is Gerald Grace. The artwork is a little more likeable when you see the full wraparound image instead of the grainy (less than) half painting shown above. Thanks Pete, you are Friday’s hero! Very much appreciated! While it’s good to know that in the flying-car-future, there will also be technology for replacing one’s limbs with spindly robot arms (and keeping the original hands), I’m not nearly as excited about their head-transplant practices. Can someone please tell me why the Amish are running around setting everything on fire? What, in the future they just finally lose it? That cover is every bit as good as the book. I’m with Simon. I never got past page 10 (it was that bad). But up to page 10, this cover really accurately reflects the tone. You know, I was under the impression that the heroine of this book was BLACK . . . so why is there a white woman here?